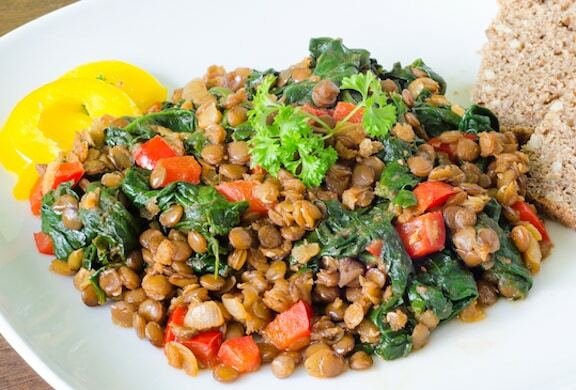 Since my family loves lentils, I keep a few cans of organic canned lentils on hand to use when we want a meal with this nourishing legume in a hurry. If you prefer to cook your own, the dish will also come together in a snap if you have them cooked ahead of time. To make this dish a little fancier, try using beluga lentils. There diminutive, gleaming black lentils contrast attractively with the greens and dried tomatoes. Green or brown lentils will taste just as good, though they’re not as pretty. This is great served with Cauliflower Rice Pilaf, Quinoa with Cauliflower, Cranberries, and Nuts, or another grain dish, plus a simple salad. Heat the oil in a large skillet. Add the onion and sauté over medium-low heat until translucent. Add the garlic and bell pepper, and continue to sauté until the onion is golden. Add the spinach and cover the pat; Cook until just wilted, 1 to 2 minutes. 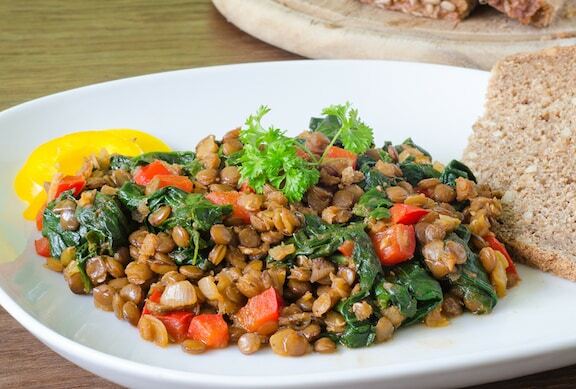 Add the remaining ingredients and stir until the spinach is evenly distributed with the lentils. Cook just until the mixture is well heated, then serve. Variation: Replace all or part of the spinach with baby arugula. I made this dish for a vegan potluck with rave reviews. I substituted one cup of dry lentils for the canned lentils. I always cook lentils in my rice cooker; one cup dry brown lentils: 2-1/2 cups water. Keep an eye on them, they will be done before the rice cooker thinks so; in other words, don’t wait for the “click”. I omitted the olive oil and I don’t think it was missed, I was, however, generous with the sun-dried tomato oil. I chopped into the ribbons basil bunch for the herbs. The garlic, tomatoes, and spinach add so much. I will make this again next week.